Free Kittens Movie Guide: Movie News: WILLY WONKA Live-to-Film...in Smell-O-Rama! 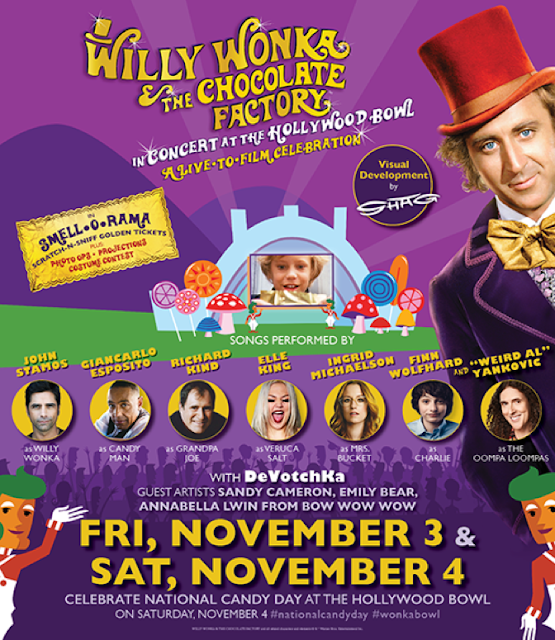 Movie News: WILLY WONKA Live-to-Film...in Smell-O-Rama! Warner Bros. Pictures’ classic, “WILLY WONKA & THE CHOCOLATE FACTORY™” starring Gene Wilder, will be brought to life this November for a special two-night cinematic event featuring John Stamos, Elle King, Finn Wolfhard, and “Weird Al” Yankovic alongside an all-star cast singing iconic songs throughout a one-of-a-kind theatrical experience. Accompanied by multi-instrumental band DeVotchKa, and featuring spectacular animation created by acclaimed painter and illustrator SHAG, this magical show will leave an everlasting impression! The singing cast includes John Stamos performing "Pure Imagination" as Willy Wonka, Finn Wolfhard (“Stranger Things,” IT) as Charlie, Giancarlo Esposito (“Breaking Bad,” “Once Upon a Time”) singing the role of The Candy Man, and Richard Kind (“Gotham,” Inside Out) as Grandpa Joe, with musicians Elle King (“Ex’s & Oh’s”) singing Veruca Salt's “I Want It Now," Ingrid Michaelson as Mrs. Bucket, and “Weird Al” Yankovic as the Oompa Loompas. The experience will also be presented in SMELL-O-RAMA with guests receiving exclusive Scratch-N-Sniff Golden Tickets and will kick off with a costume contest hosted by original cast member Julie Dawn Cole, who memorably played Veruca Salt.